Bishop John of Swansea & Brecon gives his full support and will be with us. The Peace Mala educational project for world peace is organising a one day pilgrimage to the forgotten monastery of Saint David in Llangyfelach on Thursday 9th May 2013, Ascension Day in the Christian calendar. Pilgrims, including school children from local Peace Mala Schools (Hafod Primary, Christ Church Primary, Penllergaer Primary, Catwg Primary Neath and Saint John Lloyd Catholic Comprehensive Llanelli), along with representatives of several world faiths, will join Bishop John of Swansea and Brecon in the first pilgrimage of its kind since ancient times. Pilgrims will walk from two directions. Some will start from the peace garden in Penllergaer Primary School, on to Saint David’s Church Penllergaer, through the woods and eventually to Llangyfelach. Others will meet in the peace garden at Peace Mala HQ in Morriston where the blessed light from Saint David’s shrine will be re-lit and peace votives for the pilgrimage blessed. Pilgrims will then process through the town to St David’s Church and on to Llangyfelach where a service for world peace will be held at 1pm with contributions from school children and faith representatives. 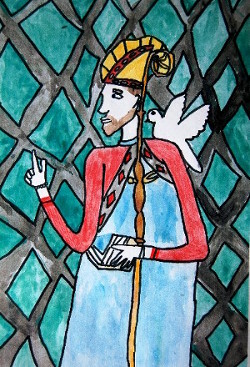 Three white doves will be released by representatives of the Abrahamic faiths along with prayers for peace in the Middle East and the whole world. Anyone wishing to be involved in the pilgrimage is kindly requested to contact our registered office by e-mail: info@peacemala.org.uk or Tel: 01792 774225. Start from Peace Mala HQ (in the peace garden weather permitting) at around 9.30am with coffee/tea and biscuits provided. The blessed light from Saint David’s Shrine will be re-lit, with prayers led by Bishop John and the blessing of peace votives for the pilgrimage. Faith representatives will be invited to offer blessings from their own traditions for the pilgrimage. The first peace votive will be lit, with prayers for world peace. Procession from Peace Mala HQ to Saint David’s Church Morriston to arrive by around 10.15 a.m. 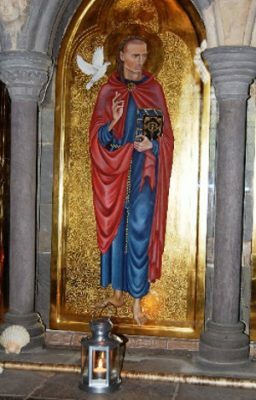 Welcome with bell ringing to receive the blessed light of Saint David and the lighting of the second peace votive with prayers for world peace.Holy Eucharist is at 10.30am in Saint David’s Church, for those who wish to participate. Celebrant: Bishop John. Eucharist on a Thursday takes half an hour. Pilgrims will leave Saint David’s Church Morriston and walk to Ss David & Cyfelach Church in Llangyfelach, where Saint David founded his now forgotten monastery. The church at Llangyfelach will seat 150. (Pilgrims from St David’s Church Penllergaer and Penllergaer Primary School will leave in time to arrive at Llangyfelach for our world peace service). Pilgrims lunch before the service. Welcome with bell ringing to receive the blessed light of Saint David and the third peace votive. A service for world peace will be lead by Revd R J Davies-Hannen (Vicar of Ss David and Cyfelach), and supported by Bishop John and other clergy. Peace prayers, peace mantras, and recitations from the Holy Qu’ran will be shared by representatives of other faith traditions. Songs for world peace will be sung by children from our local Peace Mala Schools. Saint David’s blessed light will be placed on the altar, the main peace votive will be lit, and all present will be invited to light votives for world peace. Students from Swansea University may also be involved. The focus here will be for world peace but especially for peace in the troubled Middle East where the three faiths live alongside each other. The doves will be released no later than 2pm. Let’s make this a really wonderful event and raise the profile of the spiritual power of pilgrimage, our historical heritage, the friendship between our faith and cultural communities and the work of Peace Mala and our wonderful Peace Mala schools.